Analysts beholden to Microsoft are deeply concerned about the threat posed by Apple's troublesome new iPhone: it's far too much money, does nothing new at all, it's missing all kinds of essential features, and it's doomed to fail even by such minor details as its name. Further, they are quick to point out, the iPhone is all just vaporware anyway. At least it is until June, at which time it is certain to whimper into an unappreciative market, just like Sculley's 1994 Newton or Steve Job's last bomb, the PowerMac G4 Cube. Or, alternatively, the iPhone may storm the market like a plundering pirate fleet, killing off all competition and everything else we hold dear: 3G liberties, the freedom to write our own phone apps, and the desperate plight of developers, developers, developers. Oh the humanity! The iPhone has caused more reason to fear and doubt the uncertainty of Apple's survival since the iPod, which was panned for failing to fall in line to support Microsoft's PlaysForSure / Janus DRM. Janus promised to unite the digital media world under the familiar, watchful eye of the Redmond Father, bringing all the benefits of the Windows PC monopoly to the music and movie industry. Instead, Apple screwed everything up, and the result was catastrophic: scores of loyal, participating Janus DRM licensees were beaten senseless by the renegade iPod and its promiscuous "DRM-optional" approach, which prevented consumers from living the dream of subscription rentals and exploding media features. Instead, we have podcasts--which should really be called netcasts, just to spite Apple--and the rampant piracy inflicted upon the RIAA by home users who arrogantly rip their own CDs for use on the iPod, rather than buying music tracks over again via Microsoft's convenient stores and subscription plans. There are 70 million of these "Ipod" thief boxes in distribution, threatening to starve the babies of celebrity artists, who can no longer afford food and basic medical care for their children. And what about other babies in the third world, some of whom are forced to put these iPod things together? 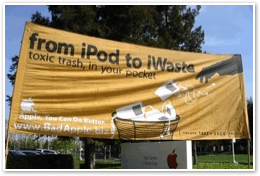 Further, Greenpeace and the SVTC report that the iPod is, technically speaking, a lethally toxic trash bomb. If only Apple had designed the iPod to use disposable batteries, so that the environmental threat of unrecycled heavy metals could be mitigated by scattering tens of millions of AA batteries throughout the world's dumps, instead of being concentrated in one single stick of poisonous gel in each iPod. This lethal pirate box is almost certain to kill any baby who might swallow one. The iPhone is likely to be even more dangerous. The same people who have been providing us with all these useful warnings about the iPod and iPhone were similarly helpful in keeping us all informed about a possible solution to the troublesome crisis invented by Apple: the prospect afforded by Microsoft's Zune, which was delivered just a couple months ago. You may have missed it, but it’s still available if you are interested. Replacing the iPod with the Zune would solve all manner of problems worldwide, from the toxicity of PVC plastic, to the poverty suffered by RIAA members. And the children, won't you please think of the children? The Zune isn't a phone of course, but it was Microsoft's answer to the 5G iPod, developed in the same timeframe as Apple's iPhone prototype. While Microsoft was trying to fairly compete against the 2005 iPod, Apple secretly did a bunch of work to release the iPhone in 2007, which is basically cheating if you think about it. After years of failed PlaysForSure developments running parallel to Apple's iPod efforts, and then regrouping to spend the majority of 2006 determining how to best kill the iPod as a solo effort, Microsoft gave us the Zune. So why wasn't Microsoft able to poop out something superior to 2005’s iPod by the end of 2006? And how is it that Apple is showing off something vastly superior just a month and a half after the Zune’s debut? If you know what's good for you, you wouldn't be asking such dangerous questions. The reactions of both frothy fanatics and the entirely unbiased mainstream media to the recent announcements of Redmond and Cupertino provide a fascinating look at the state of journalism and the reliability of reporting, as well as the credulity and short attention spans of the masses. Here's a comparison of the five phases of media coverage of Apple's announced iPhone, still six months away, and the announcement and release of Microsoft's Zune from the last half of 2006. Warning: this may cause your your face to explode. •nebulous plans to deliver an iPod Killer, revealing a new brand name but not showing off any features. •new DRM and wireless sharing features, without specifying how they would work. •the web goes wild with speculative stories of how it’s inevitable that Microsoft will take over the iPod. •pundits imagine a spectacular future of Zune development potential in 2007, including a Zune phone. •the Zune will break compatibility with PlaysForSure DRM and abandon partner's music stores. •the Zune will be a total reheating of an existing failure in the market: the Toshiba Gigabeat S.
•the repackaging would copy the look of the iPod but its copycat clickwheel would really just be a round switch. •a big new feature would be a slightly larger display of the same resolution as the iPod. •nobody could know the price, battery life, physical size, or other competitive details in advance. •Microsoft would give Zunes away with the Xbox and gobble up market share, despite low Xbox sales. •Microsoft would deeply discount the Zune to undercut the iPod via a rental music subscription subsidy. •Microsoft might stumble on launch, but would fix everything in a future update around Zune version three. •Previous PlaysForSure zealotry was eclipsed by the new gospel of the one true Zune DRM. •Zune hardware, as delivered, sucked: a clunky plastic box with a cheap Tupperware lid. •Zune software was buggy and problematic, more flash than substance. •Promised features were a huge disappointment and entirely useless. •Existing iPod features expected by users were lacking: Audible and podcast support, PDA functions, battery life. •After sales completely tanked, Microsoft dumped a press release of a "goal' to sell 1 million by June 2007. •The press picks up "1 Million Zunes" as a news story, pretending that the number is both impressive and likely. •Microsoft starts talking about future Zune products, including an nebulous "Zune phone." •Little mention is made of the Zune's target price being higher than the iPod's, and forced lower by Apple. •The 30 GB Zune is repeatedly compared against the 80 GB iPod in size and price, rather than the 30 GB iPod. Analysts aren’t concerned about Zune theft, but do fear of iPhone muggings. Laptops are no threat however. •fans photoshop phone buttons on iPods, guess the "iPhone" brand name. •speculation includes WiFi wireless features, despite the paucity of WiFi support in existing mobile phones. •the web goes wild with speculative stories of how it’s inevitable that Microsoft will deliver a phone, too. 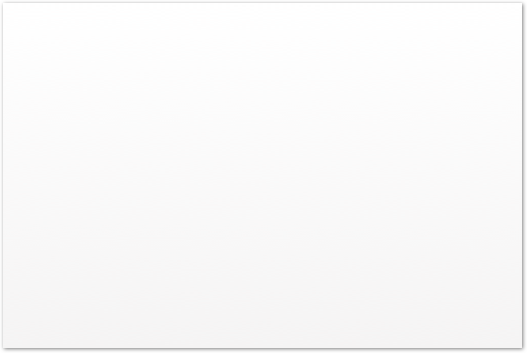 •the iPhone will maintain compatibility with iPod and iTunes content, and add support for new OS X features. •the iPhone will be an entirely new product, expanding upon the success of both the iPod and OS X. •its packaging will be entirely new, with an innovative multitouch interface on a stylus-free touch screen. •a big new feature would be a larger display with twice the resolution and slick Core Animation effects. •everyone could find its price, battery life, physical size, and other competitive details on the web with demos. •Apple couldn't give them away and would stumble in gaining any market share, despite high iPod sales. •Apple would have to deeply discount the iPhone to compete against clunkier phones with higher price tags. •Apple will stumble on launch, and likely never recover. It never has a second chance to fix any launch problems. •Previous anti-iPod zealotry was eclipsed by the new threat of the evil iPhone and how it might eat children. 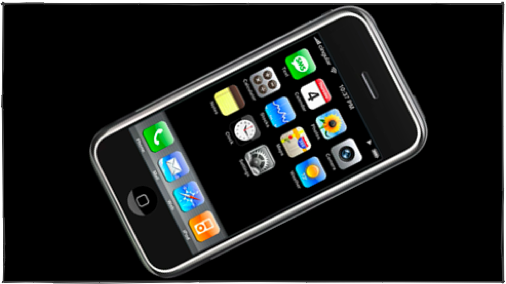 •iPhone hardware, as demonstrated, is orgasmically beautiful and slim, and offers very cool new features. •iTunes and OS X software is already proven, offering both sizzle and substance, as well as security and stability. •Promised features blow away all expectations and suggest obvious killer applications for the device. •Existing phone features expected by users were blown away: zoomable web, visual voicemail, battery life. Distractibility: Please pay no attention to what's actually going on, and focus on BS instead. •Apple immediately announces a "goal' to sell 10 million by 2008, and contracts to build 12 million units. •The press nearly ignores "10 Million iPhones," pretending that the number is unimpressive and unlikely. •Little mention is made of the iPhone's target price being much lower than WinCE phones with fewer features. Apple backdated options in 2002! Just like Microsoft in 1999, except this time it’s big news. Greenpeace Says Apple Is Toxic! iMac eats third world children whole! Or maybe not. Steve Jobs risks being hit by a bus! Or sick! Or could be fired by board! Or should be! Cisco owns the iPhone name! Apple should just sell the company and hand proceeds to Cisco, to be fair. Does this comparison sounds vaguely familiar? It might, if you’ve been paying any attention. •In the early 1980s, Microsoft announced it would deliver a Mac equivalent on the PC. - Windows 95 came ten years later on top of DOS, with a clumsier interface than the Mac. •In the late 1980s, Microsoft announced it would deliver the next DOS with IBM: OS/2. - NT came many years later, and could run for nearly a month before being rebooted. •In the early 1990s, Microsoft announced it would deliver an answer to NeXTSTEP with Cairo. - It never really did, but try Windows 95, okay? It can even run Bob. •In the late 1990s, Microsoft announced it would deliver pen computing. - After years of Windows for Pen failure and WinPad vaporware, WinCE didn’t impress. •In the early 2000s, Microsoft announced it would deliver a brand new Windows. - Vista came years late, missing features, and unimpressive. More recently, there’s also been announcements about owning media playback with Windows Media Player, owning video games with the Xbox, owning media DRM with Janus DRM, owning media players with the Zune, and owning media downloads with PlaysForSure. None of those has happened. Will somebody please tell the pundits? They still seem to think Microsoft’s announcements are worth repeating. When Steve Ballmer was asked his reaction to the iPhone’s announcement, he didn’t try to compare it against the Zune, but rather Motorola’s Q phone, which runs Microsoft’s Windows Mobile. He tried to fix attention on the difference in price. Cingular Apple iPhone vs. Verizon Motorola Q explains how.